The “first-light” image from NIRES is of NGC 7027, a planetary nebula. The NIRES spectrum shows the near-IR spectrum of this nebula dominated by emission lines of hydrogen and helium. The direct image shows NBC 7027 in the K’ filters at 2.2 microns. Maunakea, Hawaii – Astronomers at W. M. Keck Observatory have successfully met a major milestone after capturing the very first science data from Keck Observatory’s newest instrument, the Caltech-built Near-Infrared Echellette Spectrometer (NIRES). The Keck Observatory-Caltech NIRES team just completed the instrument’s first set of commissioning observations and achieved “first light” with a spectral image of the planetary nebula NGC 7027. 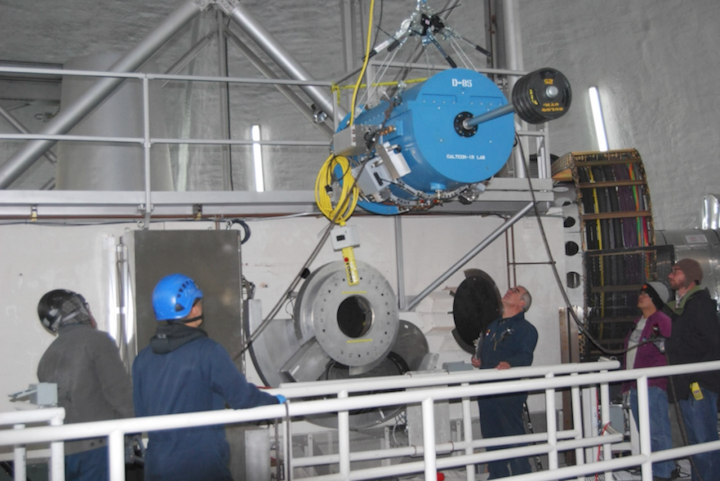 NIRES arrived at Keck Observatory from Caltech on April 17 and was installed on Keck II on September 28. This long-awaited instrument is perfectly suited for time domain astronomy follow-up observations of targets identified by new surveys that are designed to find transients and exotic objects. Matthews developed the instrument with the help of Tom Soifer, the Harold Brown Professor of Physics, Emeritus, at Caltech and member of the Keck Observatory Board of Directors, Jason Melbourne, a former postdoctoral scholar at Caltech, and University of Toronto Department of Astronomy and Astrophysics Professor Dae-Sik Moon, who is also associated with Dunlap Institute, and started working on NIRES with Matthews and Soifer when he was a Millikan postdoctoral fellow at Caltech about a decade ago. Because NIRES will be on the telescope at all times, its specialty will be capturing Targets of Opportunity (ToO) – astronomical objects that unexpectedly go ‘boom.’ This capability is now more important than ever, especially with the recent discovery, announced October 16, of gravitational waves caused by the collision of two neutron stars. For the first time in history, astronomers around the world detected both light and gravitational waves of this event, triggering a new era in astronomy. With its high-sensitivity, NIRES will also allow astronomers to observe extremely faint objects found with the Spitzer and WISE infrared space telescopes. Such ancient objects, like high-redshift galaxies and quasars, can give clues about what happened just after the Big Bang. NIRES arrived at Keck Observatory in April. It will be available to the Keck Observatory science community in February.